The main reason for my near term bearishness is the $30 billion in secondaries that we will see this week. I believe market participants will need to sell down other positions in order to make room for this supply. Another factor working against the market is that we are now overbought as seen in the chart below. Originally I thought we were going to get oversold into options expiration but the market re-rallied. 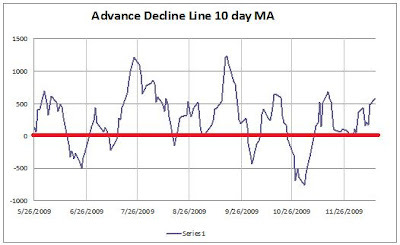 For 8 out of the next 10 days we will be dropping positive numbers from the 10 day moving average of the NYSE advance-decline line. That means that we would not be maximum oversold until Christmas. Here is a look at the raw data. That would also go hand in hand with buying on a lunar cycle of a full moon. Short new moon and buy full moon.